I really love pickled beets, I can eat a whole jar in one setting if I don't watch myself. If you have never tried pickled beets you are missing out. This recipe is so simple you must give it a try even if you have never canned anything before. This winter you will not believe how good home canned food tastes! I love to open a jar of something I have canned from my garden in the winter, brings a little Spring back to Beaty's Creek. This is What's Cookin on Beaty's Creek today. Remove beet greens and save to use later. Wash beets very well and place in pot covered with water. Bring beets to a boil and boil for 20 minutes or until fork tender. My beets were not real large, (I like small beets for pickles) so they cooked for about 15 minutes, size matters on how long your beets will cook. Once boiled let beets cool and then remove beets skin. Remember to wear gloves or you will have purple hands. Now get your jars ready to go, I use pint jars for pickled beets, I like the smaller jars for pickles but you can use quart jars if you wish. Prepare your jars as you would for canning anything. Once ready pack with your beets. 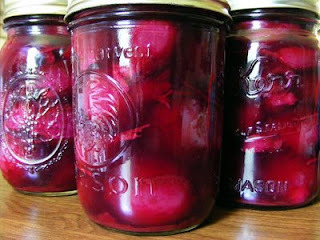 Now bring beet water, vinegar, sugar, and cinnamon to a boil and pour over beets in jars and seal with a flat and ring. You will process beets in a hot water bath for 12 minutes. Let pickled beets sit for a couple of weeks before you eat them.